Team India is back in their practice nets and are all set to stand their first meeting with arch rivals Pakistan. Indian captain Mahendra Singh Dhoni will be riding high afresh to a new start both on and off the field. He is backing his boys and feels that everyone has got enough idea of their responsibility and it will be put to test in days of time. A disappointing Test and ODI series here in Australia wouldn't have bothered Mahi much because the ultimatum lies in team performance in the upcoming big show. Talking about committing mistakes in batting and bowling, he says the practice will give them a lot of time to rethink between the matches. Here's why Indian cricket team should look solid in their upcoming approach to the World Cup 2015. It is obvious that both Kohli and Rahane will play a key role in paving India's conquer to success ladder. Kohli was instrumental during India's approach in the test series down under, but his recent ODI form is again asking for few questions. Rahane was second best during the test series, but again the ODI form needs to be gathered back timely. Even a small mistake in a match or two could just be a deciding factor in the final stages. Lower order will be strengthened by captain himself, Suresh Raina and Ravindra Jadeja. Rohit Sharma and Shikhar Dhawan at the top should take the guard against the new ball well to see India through in the initial overs. This will help upcoming batsmen Kohli and Rahane to make the most of the old ball for runs. New ball bowlers - Mohammed Shami who had his best time in 2014 will need to strike an early form against tough teams. Early wickets will be the key, and who knows it better than Bhuvaneshwar Kumar, the masterpiece of swing bowling under seaming conditions. He will lead the pace and share the new ball with Shami to give India crucial breakthroughs in the initial overs. In the middle overs Ashwin and Jadeja should bowl in tandem to create more and more pressure upfront. Fifth bowler - Stuart Binny holds the key in every match with his crucial runs down the order and bowling. We might even see Suresh Raina join the attack to provide bowling stability on spin friendly tracks. India might have gone with a relatively inexperienced side, but each and every individual will hold an important role to play especially when defending a score or creating pressure. Fielding was disappointing during the tests and recently concluded one dayer's. But it doesn't seem India are down with their energy's. The boys will be up and going in the World Cup season for sure! 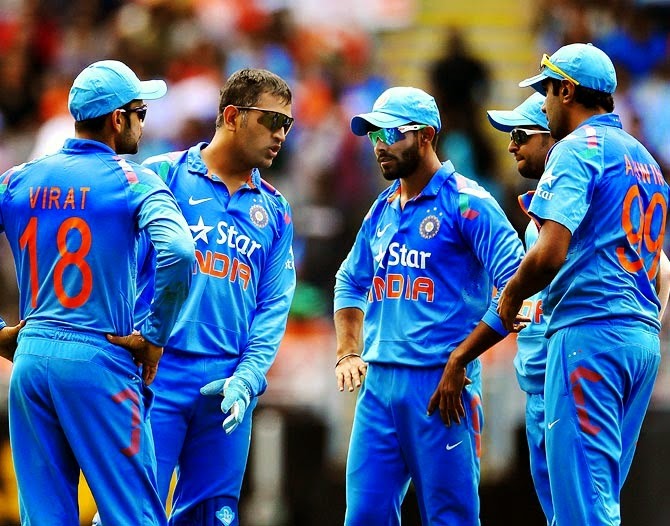 Raina, Kohli, Jadeja, Rahane and Dhawan will be holding key in their fielding departments. Dhoni is known to be a masterpiece especially when revolving his bowlers to trap the opposition batting line up. He has an experience of captaining India in 8 ICC tournaments, enough to do justice as a captain. He will not require any advises and neither he will work according to other's plan. 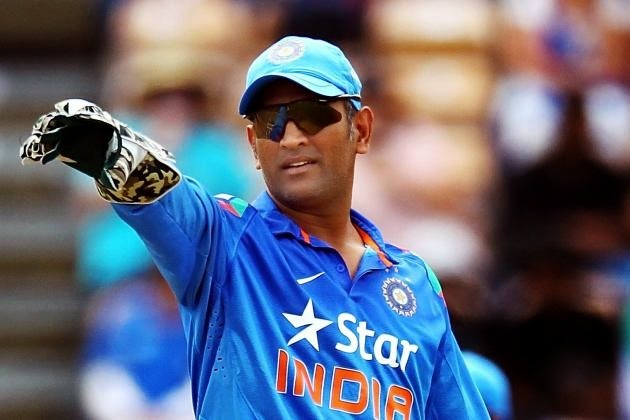 This will also be Dhoni's last World Cup, so it will obviously be an eye catching contest and a proud moment when he leads India in every match. Both Kohli and Dhoni will be involved in making key decisions when they appear for World Cup matches against key sides. Group B has all the contenders from subcontinent pitches, so alike India every team will face tough instances of batting and bowling on Australian decks. Even the most preferred team - South Africa lost 4-1 to Australia last year in December's ODI series. India holds a better chance to win over every opposition apart from South Africa. The key will be to maintain the consistency right through to the knockout stages of the World Cup. Team India definitely had few days of rest after their disappointing end to the Carlton mid series. A few tired legs in the Indian camp since the test series were of B.Kumar and Shami. Both are fresh now after few off days, the entire team is looking more confident to do a decent comeback. Normally you would associate the team requiring to hit the nets hard frequently, they do, and are looking quite confident of their success in games to come. Two practice games will give the team enough strategy and time to decide on the final days. Game against Australia will be the key for testing both their bowling and batting which should complement each other. So there's an equal chance of India atleast making it to the final rounds if not give us a surprising win at the ICC Cricket World Cup 2015.